Marbella Holiday homes in Andalusia for an unforgettable holiday. We offer you the best holiday houses in Andalusia at the nicest spots. View our array of holiday homes, bungalows, apartments and holiday parks in Andalusia and book your holiday home here. Offering free Wi-Fi, each elegant, air-conditioned room and villa at hotel Don Carlos Marbella has a flat-screen TV, with a selection of films. The spacious bathrooms include Molton Brown toiletries. Don Carlos Leisure Resort & Spa has 5 bars and restaurants, including the Ombú Thai restaurant, set in a tropical garden. The terrace cocktail bar offers live music and panoramic views. The resort’s luxury spa features a sauna, Turkish bath and hydromassage, as well as a range of exclusive treatments. There are also 9 clay tennis courts on site. In summer, the hotel holds luxury parties at the famous Nikki Beach Club. Center is 11 km away. Accommodation Set right on Puerto Banús Harbour, this stylish aparthotel offers a private beach club, a hot tub and gym. The Park Plaza Suites Apartamentos have elegant modern décor and air conditioning. They include a lounge-dining area with a sofa bed. Kitchens come with a dishwashing and a washing machine. 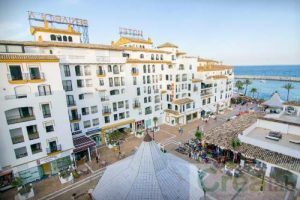 The complex is surrounded by the fashionable shops and bars of Puerto Banús. Nueva Andalucia Beach is 150 metres away. You can hire a car from the 24-hour reception to explore the Costa del Sol. French cuisine is served in the Park Plaza Suites’s restaurant, which has a seafront terrace. The lobby bar offers live music in a relaxed atmosphere. Accommodation Latest booking: 6 hours ago. Rooms at the 5-star Don Pepe have views of the sea, hotel gardens, or mountains. They offer interactive satellite TV, an electronic safe and a minibar. All rooms have free Wi-Fi. Don Pepe hotel’s “Life & Sun Clinic” offers personalised, professional health services to guests. Guests of the hotel receive free access to the heated indoor pool and gym. The hotel also has tennis courts. The spa includes a Turkish bath, hot tub and sauna, and offers various massages and treatments. The hotel also has a grill restaurant specialising in steak, and Mediterranean and barbecue specialties. Its Tahini Restaurant serves Japanese cuisine and offers ocean views. 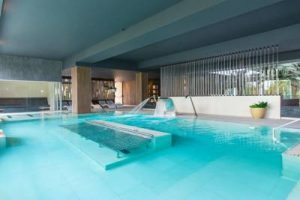 There is also a poolside bar, as well as a gourmet corner which includes an oyster and caviar bar and an area serving Belgian chocolate and macaroons. There is also a private beach club serving snacks, cocktails and smoothies. 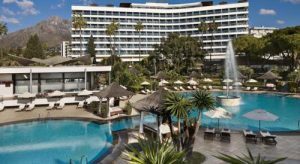 Situated on the popular Costa del Sol, Gran Meliá Don Pepe is just a 5-minute walk from Paco Cantos Park. Marbella’s historic old town is less than 2 km away. The name Andalucia is derived from “Al-Andalus”, the Moorish name for the Iberian peninsula. Of the 17 “autonomous communities” that make up Spain, Andalucia is the second largest in land area. The region is home to Spain’s highest mountains, and nearly 15 per cent of its terrain is over 1,000 meters high. The region was conquered by the Romans in 206BC. The emperors Trajan and Hadrian came from Andalucia. During the Moorish occupation in the Middle Ages, the Andalucian town of Cordoba became the centre of power, when the Great Mosque of Cordoba was built. Granada’s Alhambra palace is another great remnant of the Moorish era. Many towns in southern Andalucia bear the words “de la Frontera” in their names, reflecting their one-time status on the border of the Moorish occupation as it was pushed back. The town of Ronda is host to Spain’s oldest still-running bullfighting ring, built in 1784. It is open to tourists. Andalucia is considered the home of bullfighting and flamenco. Also Bed Breakfast Bed and Breakfast B&B BB or BnB details for your next vacation local information guide. B and B is an English traditional holiday idea, often hard to find in some parts of the world. Take A Break Holidays takeabreakholidays, Marbella Accommodation.